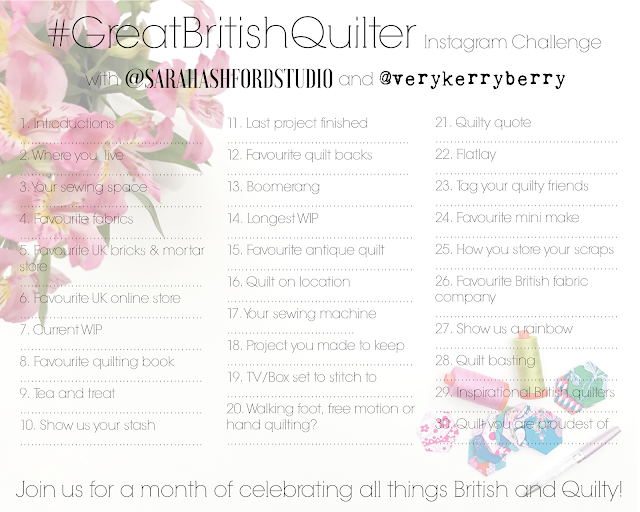 If you're on Instagram, you may well have taken part in last September's #GreatBritishQuilter Challenge. 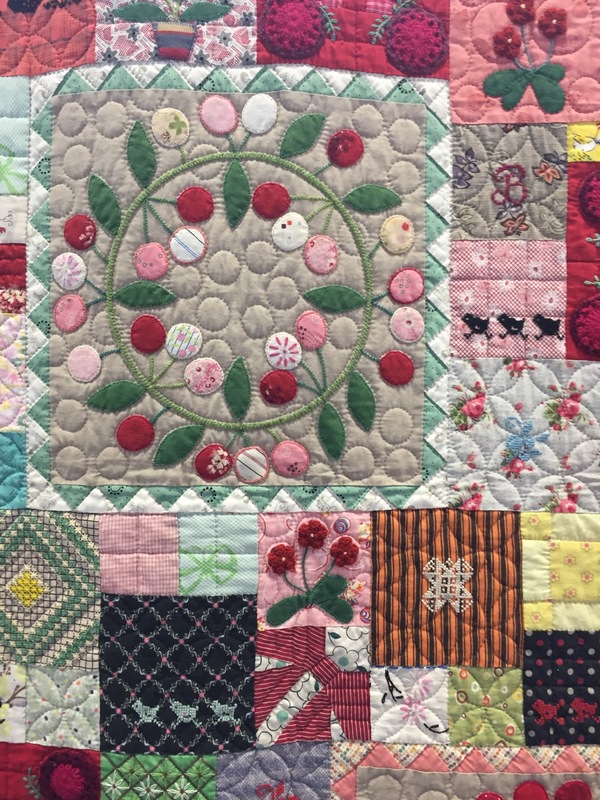 It's a daily photo challenge, all about quilting which aims to celebrate all things British and quilty- you don't need to be in the UK to take part! It was started by Sarah Ashford and Charlie Mankin and it really took off with a great community feel around the hashtag #GreatBritishQuilter, reminiscent of the Flickr group days for those who can remember that far back! It returns for September 2018, but with a change. 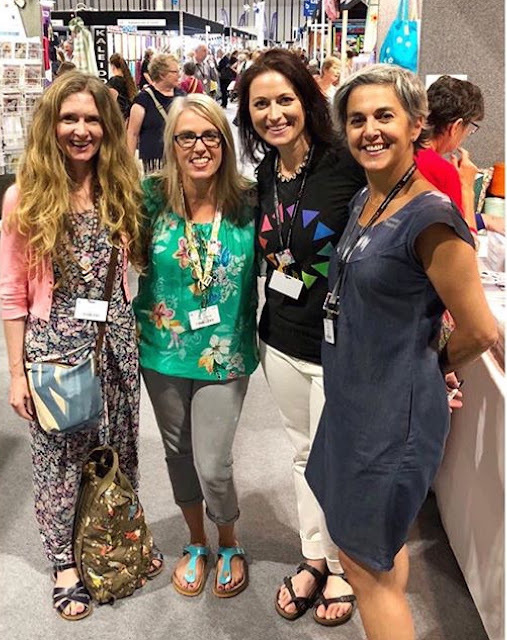 As her Stitchsperation business is growing rapidly and needs more of her time, Charlie has decided to step away and Sarah very kindly invited me to be her new GBQ partner! 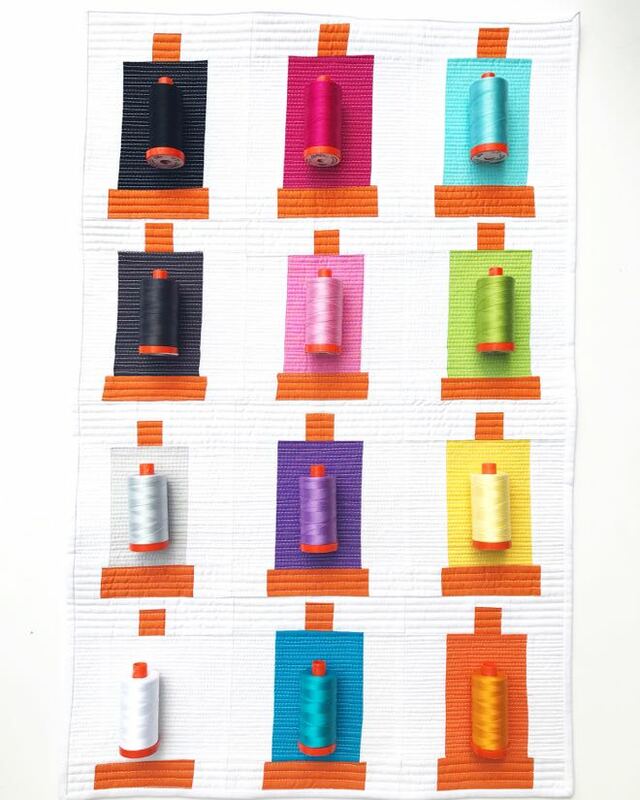 So, to celebrate, the free Aurifil spool foundation paper piecing pattern which I designed for the spools quilt as part of the #GreatBritishQuilter/Aurifil Threadbox launch is now available to download for free! 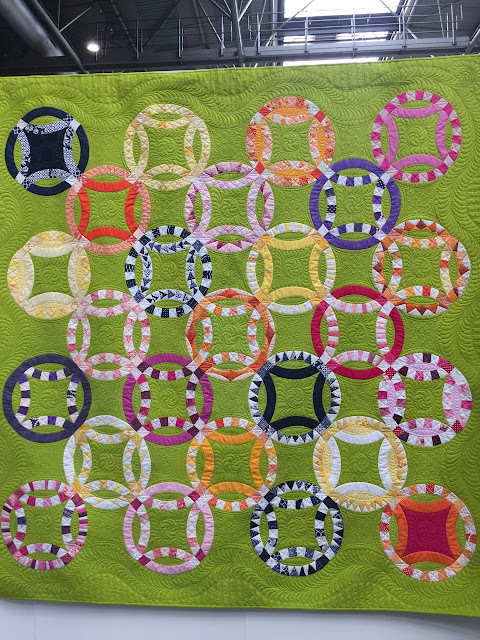 zIt's an easy block to piece and there are three options so you choose a full, medium or skinny spool -all make a 6" x 7" block finished. Find the pattern free in my Payhip shop. 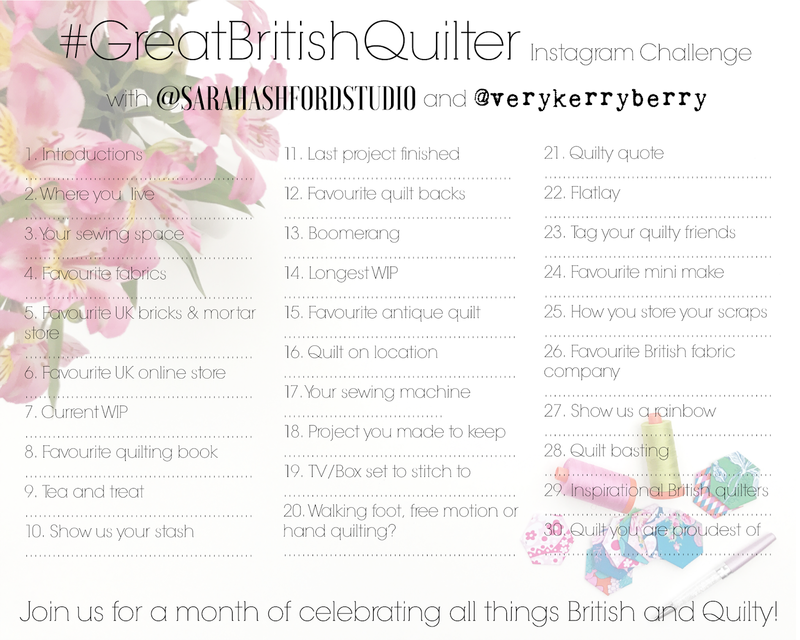 And here's the #GreatBritishQuilter prompt sheet for those of you who like to be prepared! Let me know if you're thinking of taking part in the challenge. 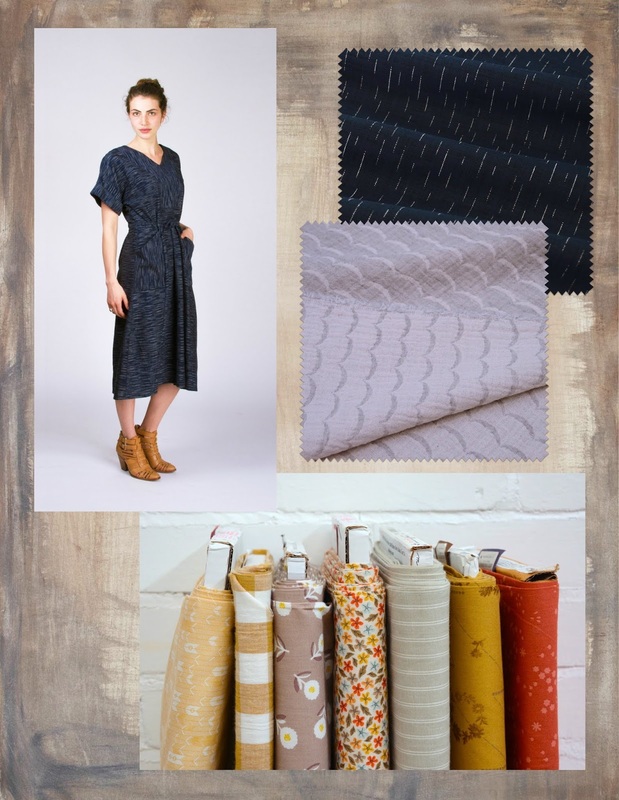 We're moving out of Summer and into Autumn in the UK, a time of transition so for this month's sponsor visits to Eternal Maker and Plush Addict, I've chosen colours, fabrics and styles that fit with a change of season and keep the mix of dressmaking and quilting that I love. Tea House Top and Dress by Sew House Seven Paper and PDF versions. I've included this as it's on my September make list. I've had the pattern for a while and it looks like the ideal transitional dress, especially the longer version so if I include it here, it might give me the push to get it sewn! There are no extra fastenings to include and I think it could be worn over a skinny long sleeve top to give it a longer wearing time. 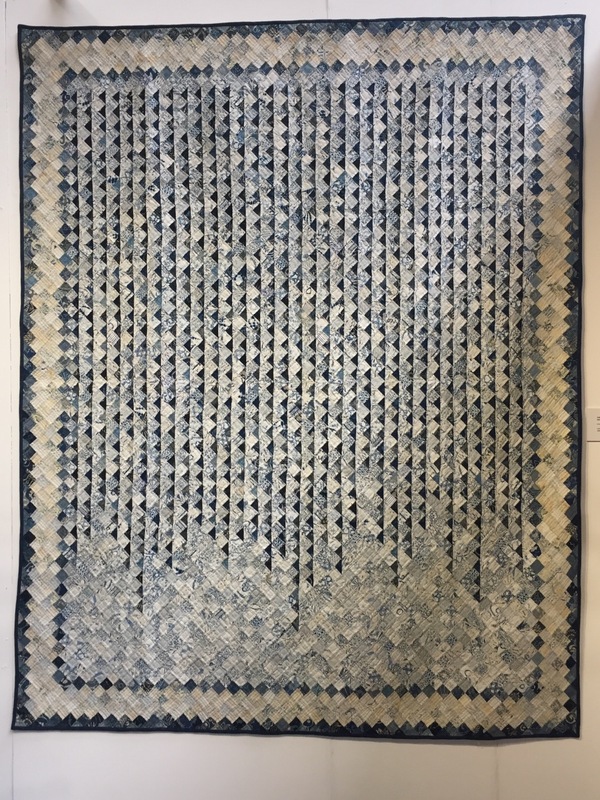 Dashes- Indigo Woven from Sevenberry. Medium to heavy weight with texture. Ideal for cushions bags and heavier weight structural clothing. 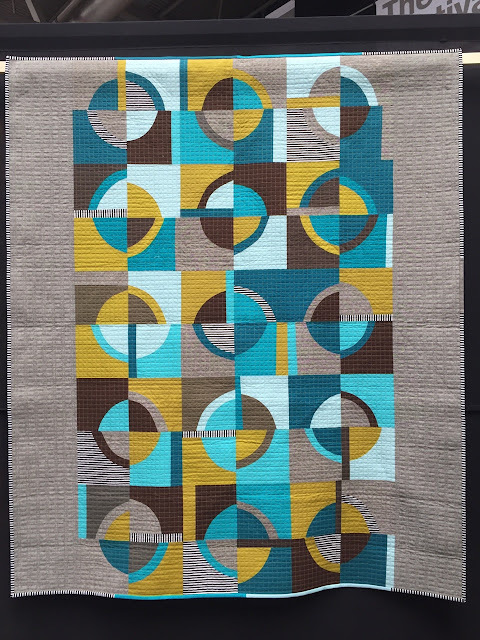 Mustard Rust: Eternal Maker custom fat quarter bundle. I love the curated bundles at Eternal Maker, they put together what looks like an effortless combination and this one is the perfect autumnal mix with the warm colours and the textural mix of cottons with linen blends. Cork Fabric: with natural and dark metallic grain. I've yet to try cork fabric but I've seen so many bags and purses made with it and it has great structural and textural appeal. Kellie Rose describes this as feeling like leather and it's also known as cork leather. Denim 11oz 150cm wide. Dark denim, ready for clothing, cushions, bags and accessories. You can read a handy guide to denim weight here which includes guidance and tips for sewing; at under 12oz, this is in the lighter weight category. 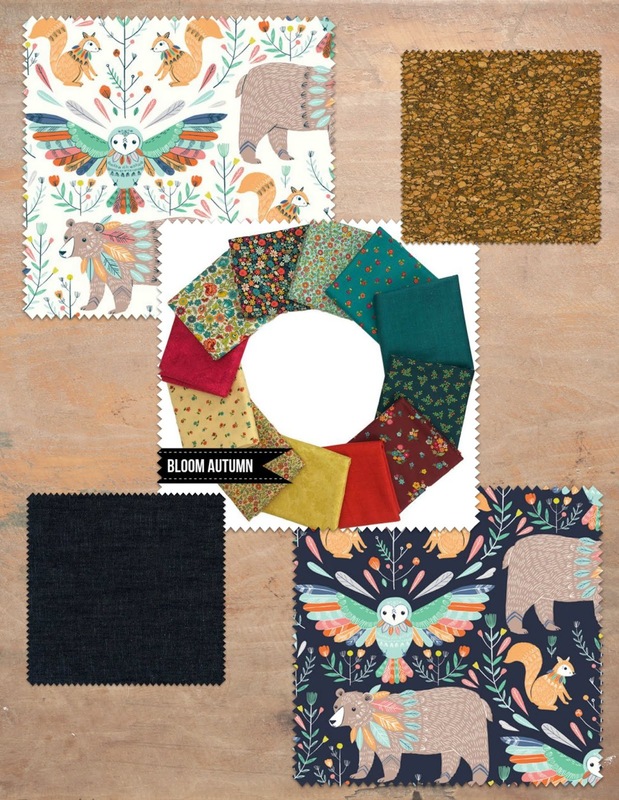 Makower Bloom Autumn FQ Bundle (11 fabrics). I couldn't resist this bundle with the title and colourway! Dashwood Boho Meadow Animals in white. Designed by Bethan Janine (also available in dark blue). I've got a basic membership to Picmonkey so I've been playing around with some mood board style layouts to collate the images which is fun to do! 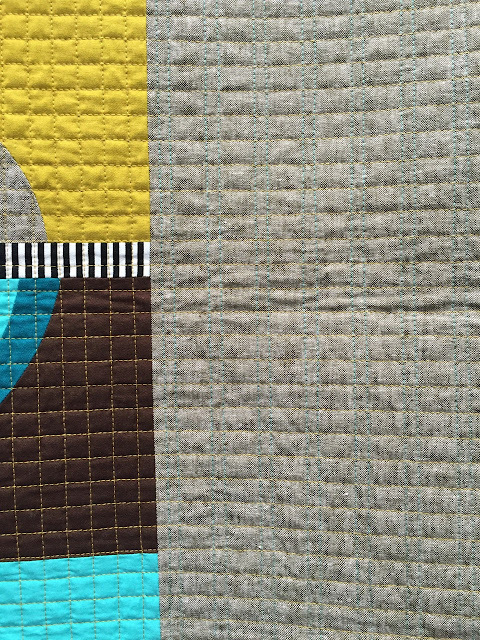 Find part one of my Festival of Quilts experience here. 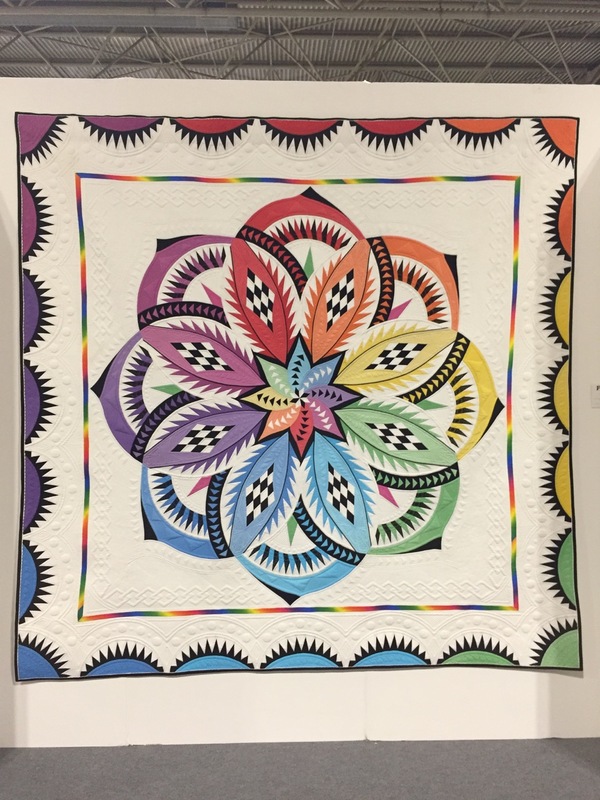 As well as the multitude of competition quilts at Festival of Quilts, there are galleries scattered throughout the exhibition space. 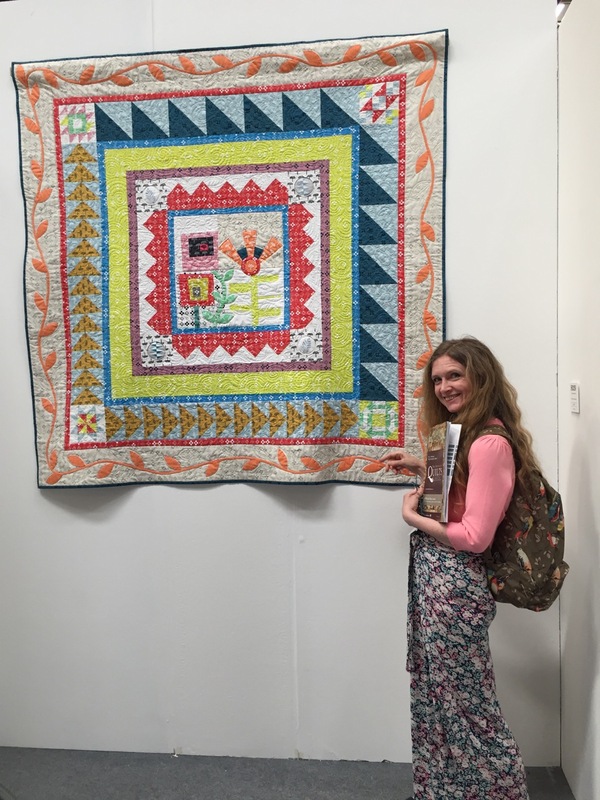 They were very varied and there was something for everyone from the historical tradition of the 1718 Silk Patchwork Coverlet through to the experimental work of the latest textile graduates from City Guilds level three where the quilting boundaries were challenged. I didn't view them all, there isn't enough time in one day to see everything so what I saw was a mix of purposeful and random! Shizuko Kuroha's quilt gallery, 'Indigo and Sarasa; Pieces of my Life', felt like a calm, quiet, self-contained space amidst the bustle of a busy show. The limited colour palette and play with light and dark made it a very cohesive gallery and each quilt was an artwork that I could look at for a long time and still see more. 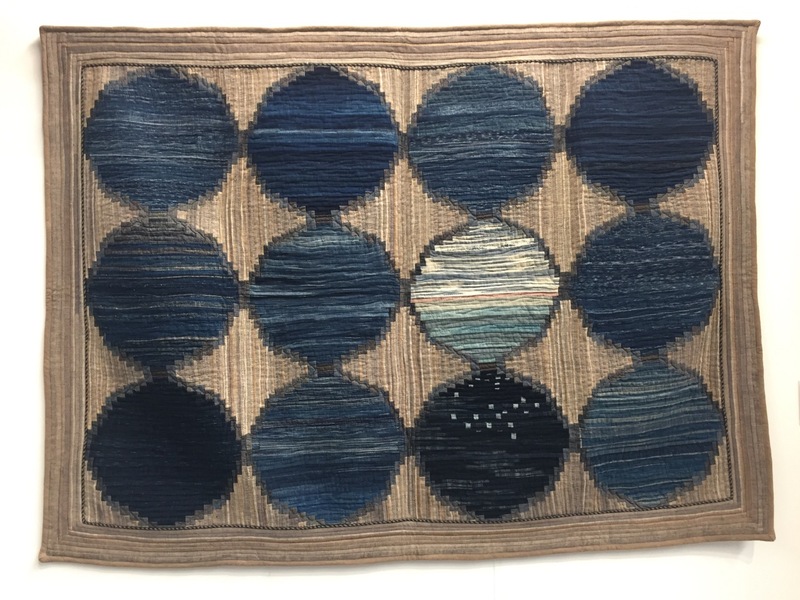 She uses lots of antique indigo dyed textiles and this was the first time her work had been shown in the UK. I love the crazy, tumbled, organised nature of this quilt! 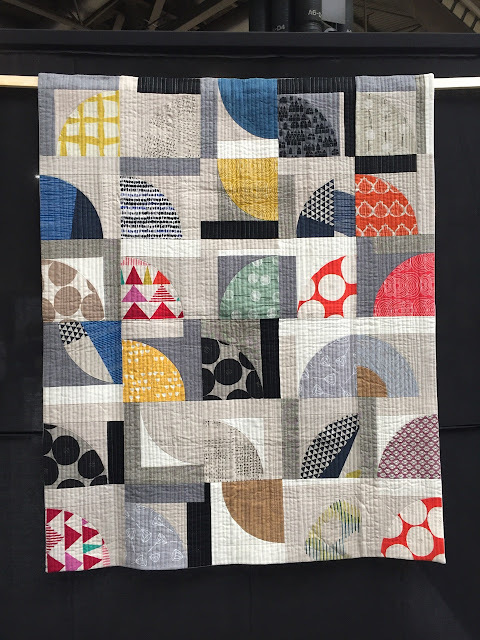 The mix of hand and machine piecing, applique, pen and hand quilting, plus the many favourite fabric prints that I recognised made this quilt call out to me! 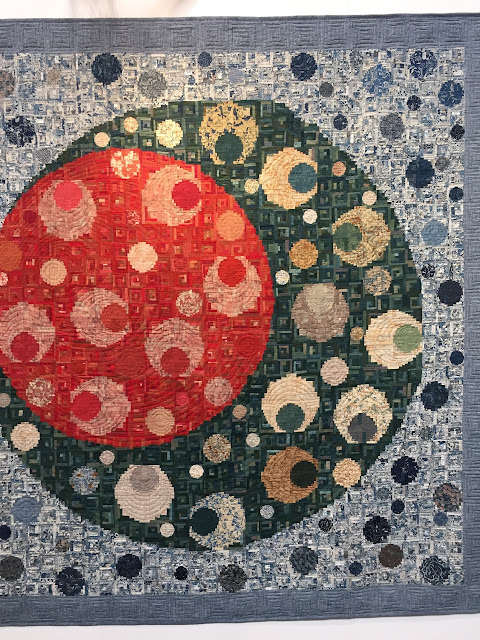 Lots of elements appealed to me in this next quilt, 'Many Cherries in the Garden', by Takeko Sato. It is a riot of beautifully executed colour and construction. Techniques include: crochet, appliqué, embroidery, ruching flower, hand piecing, hand quilting. There 1718 Silk Patchwork Coverlet was a must-see for everyone. 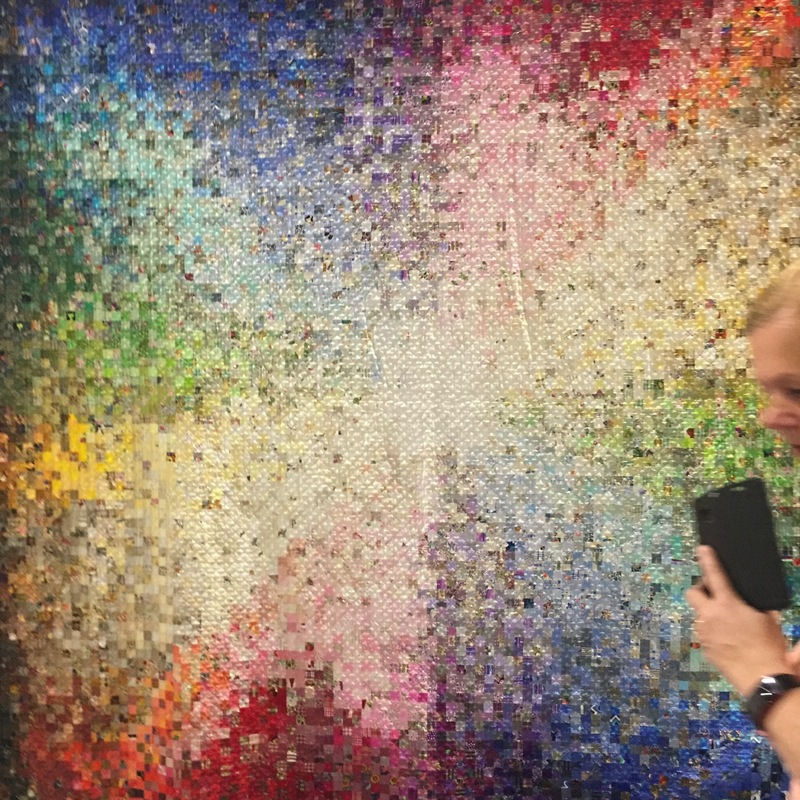 It was displayed flat and covered with a protective screen which did make it suitable for lots of people to view at a time, and it was surprisingly vibrant after so many years. I felt like I had seen tonnes of quilts and inspiration, and then I looked on Instagram at what had other people shared, and then I realised how little I had seen! I think next year, I will add an overnight stay and split my viewing across two days. I saw a few other galleries, no more photos as I did take time to put my phone down. 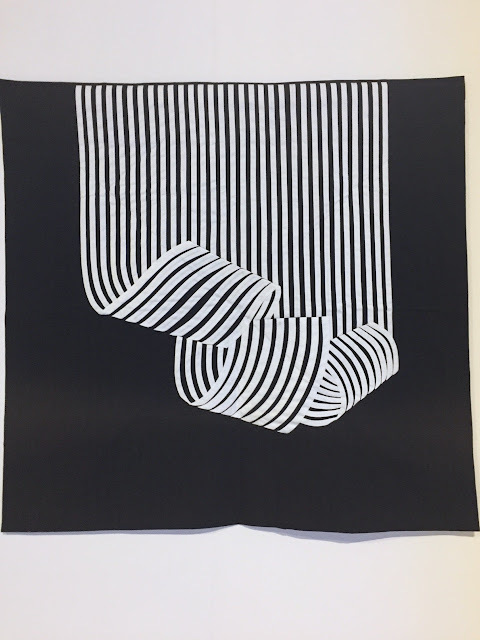 Ruth Singer's Criminal Quilts project was totally absorbing, I wish I'd spent longer there. I would also like to have browsed a few more shops, there are so many specialists in one place, it seemed a shame not to see more. One thing that does require time is the socialising! 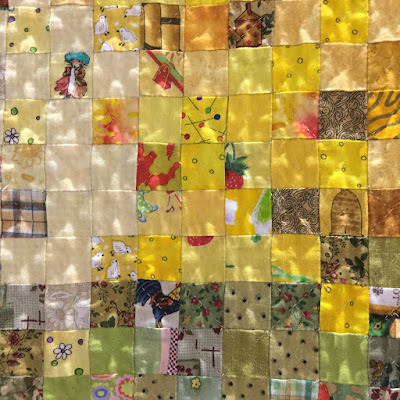 I saw so many people I knew- from Fat Quarterly retreats, Threadhouse, South West Modern Quilt Guild, Instagram. I thought finding people would be like the proverbial needle and haystack but actually, I bumped into everyone who I even vaguely knew was going to be there on Thursday. That's the 'festival' element, I felt truly with my tribe. 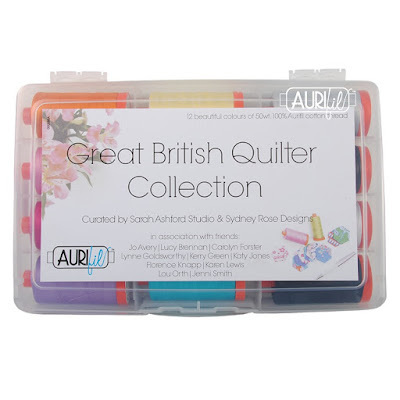 An extra social event was taking part in the Great British Quilter/Aurifil Threadbox launch (a 'live' video of the event can be seen here). You can find the box at Mybearpaw shop. 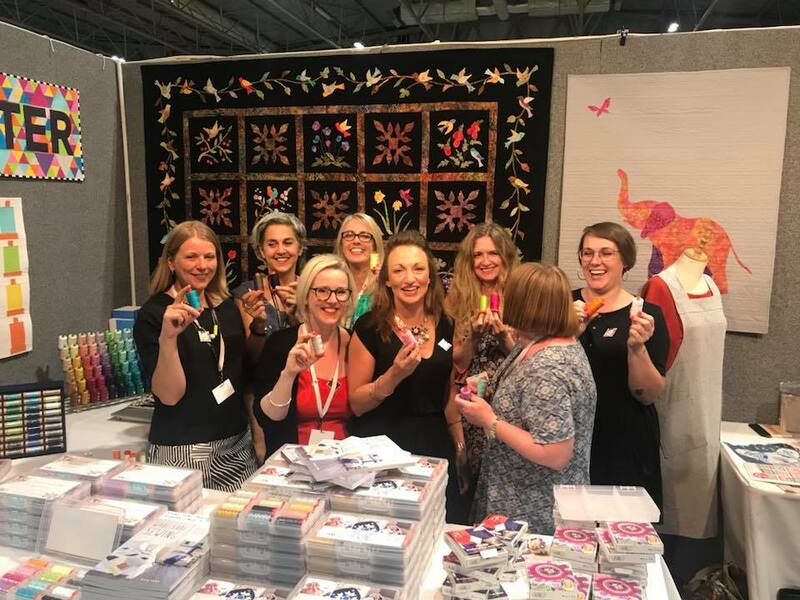 This was huge fun and a chance for me to meet some of the GBQ talent in person for the first time: left to right, Jenni Smith, Karen Lewis, Charlie Mankin, Jo Avery, Sarah Ashford, me, Carolyn Foster and Lucy Brennan. Thank you to Sarah and Charlie for doing an amazing super job organising and coordinating this. I also met Sarah/Sariditty who will be the fourth teacher at the January 2019 Threadhouse retreat, she was really lovely! Buy an advance ticket and a show plan. Plan your shopping. 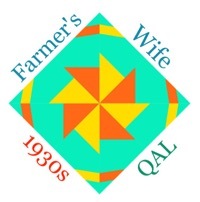 The Festival of Quilts website includes an alphabetical shop inventory and their stand number. I made a list on my phone, it focuses your mind! Workshops usually need pre booking but there are on the day places to take part in mini makes or talks to listen to. It is busy, but not unmanageable - I'm not a lover of crowds. The busiest point is in the middle of the day. I was there until closing time at 5.30pm, much quieter then, ditto for the start of the day. Check the gallery info before you come so you can make sure you don't miss your favourite. But also be prepared to go rogue into an unknown gallery, you never know what you might find. Competition category winners weren't revealed until after 2pm on Thursday, those quilts were covered until then. Wear comfortable shoes and light clothing, it's warm and there's a lot of time walking and standing. There were some areas to sit, especially in the NEC area, but I didn't want to miss anything and I was on my feet all day. Don't plan anything for the day after. I was so tired! Take plenty of snacks and water, especially if you are on a restricted diet (veggie/vegan/gluten free). 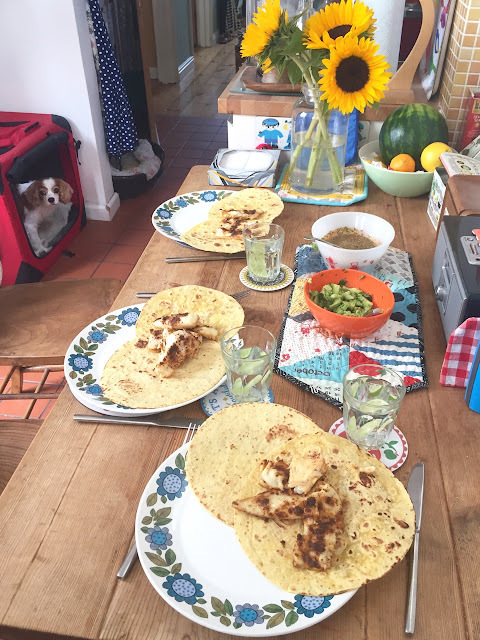 Popular eating times create long queues and there is a limited choice. There was a coffee bar in the FOQ hall on the Lewis and Irene stand (great idea!) and in the VIP ticketed area. If sitting and a moment of quiet is a big factor for you, consider a VIP ticket, less queuing, cafe/seating area. It is a lot more expensive but it may well be worth it. I didn't even think about the workshops this year, but with a two-day visit (I'm planning a two-day ticket for next year) I think I will. 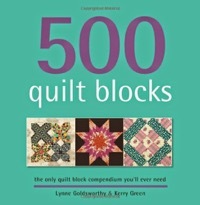 Quilter's Guild members get first pick of workshops (some are very quick to sell out) and discount on tickets too. I found the show so much more than the shopping experience. I went to the Knitting and Stitching show at Ally Pall last summer and whilst I enjoyed it, there was no social element. 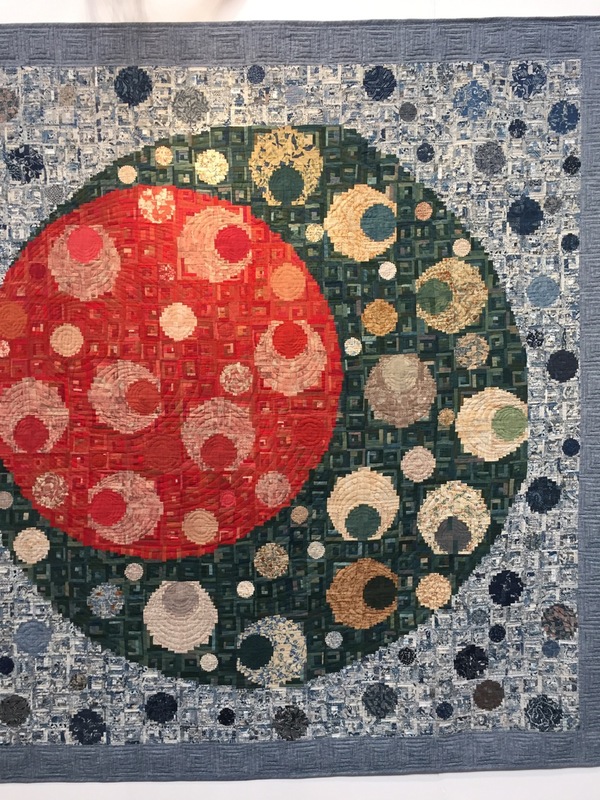 I am going to view Festival of Quilts more as a specialist holiday where I get reunited with my people, admire wonderful creations, marvel at the galleries and leave inspired by the talent and excited to create. What can I say, I totally underestimated the power and effect of The Festival of Quilts. Even now, I am assessing the impact of going. 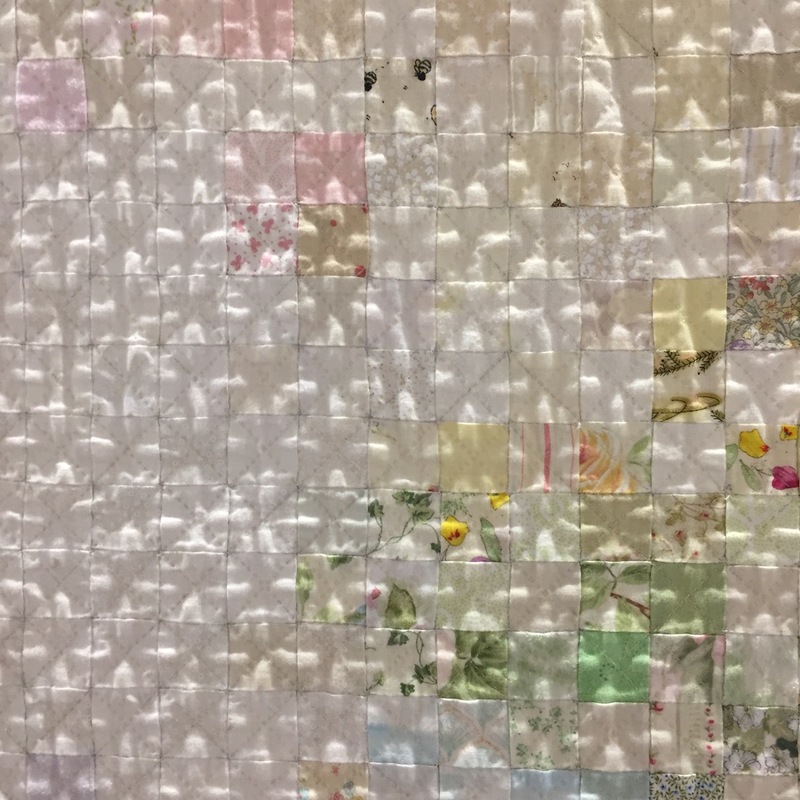 I imagined a large shopping space with exhibition displays, but it was so much more than that, so much more than other textiles/fabric/stitching shows that I've been to. I travelled by train, about 3 1/2 hour journey, and I could easily spot other FoQ goers by their handmade bags! I didn't realise that Birmingham International station is physically attached to the NEC- it's a continous internal walkway from the station to the venue, a bit like being in an airport. The NEC has the usual eating and drinking facilities, toilets etc which are outside the show and with a ticket you can walk inbetween the two so if things get a bit much inside the festival, you go to these areas. The quickest way to enter is to buy a ticket in advance - the on-the-day-ticket queue is long. There are multiple entry points and I did find the main space inside really tricky to navigate- buying a guide with a map inside was essential. Apparently, the layout is the same each year so next year should be easier! I began in the shopping zone. As I was only there for the day, I had prepped a list of shops to visit, so I started with Eternal Maker, Linladan and Beyond Measure and had a peep at lots of others on the way. 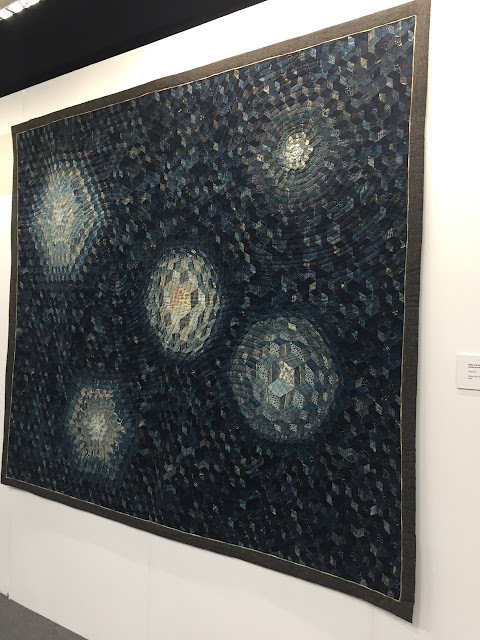 Then I headed for my main focus: the exhibition quilts. 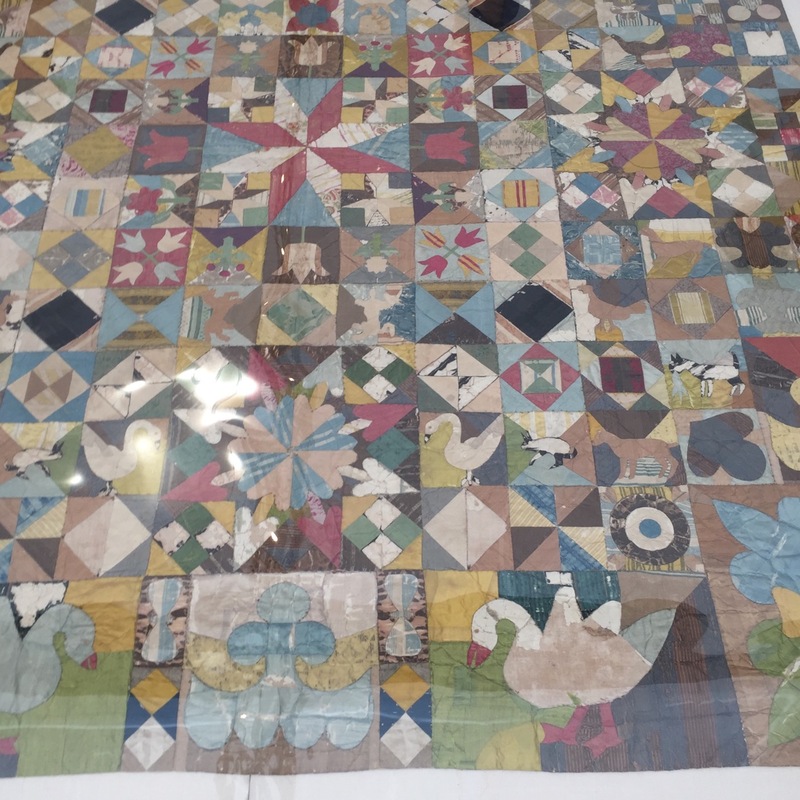 This was possibly my favourite exhibition quilt and one of the first I looked at. I met Cat Haggart who I've known from IG but not met in person and she nudged me towards this one. Ann Pill, 'Hundreds and Thousands', cotton scraps, 1" finished squares, hand pieced, muslin middle and hand quilted. I loved the effect of this one from a variety of view point. 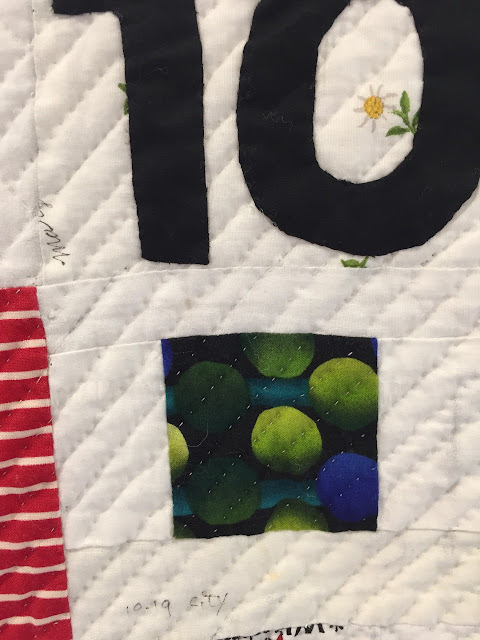 When looked at from a distance, its quilting facets shimmered, then close up each print can be seen individually confirming its scrappiness! 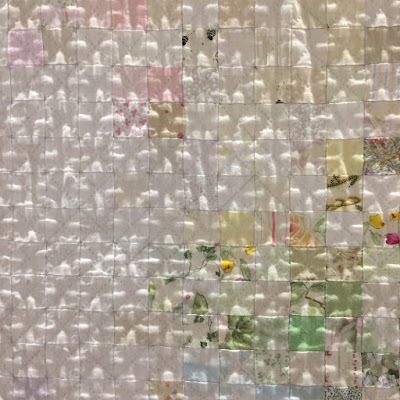 In this light section, the dimentional effect of the quilting really shines. It combines traditional methods, a basic shape and a modern sensibility- great use of colour in all it's varieties. This one also blew me away, 'Vintage Rose' by Janette Chilver. 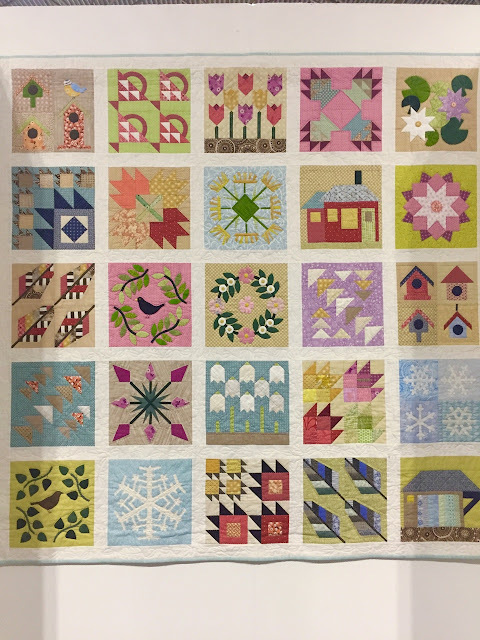 Janette had several quilts in different catergory. She is a long arm quilter and this quilt was pieced and quilted by her. I loved the tradinal setting, the soft use of a 'rainbow' achieved with hand dyed ombre fabrics (Janette dyed the fabrics) and the whole effect of the completx piecing and detailed quitling. 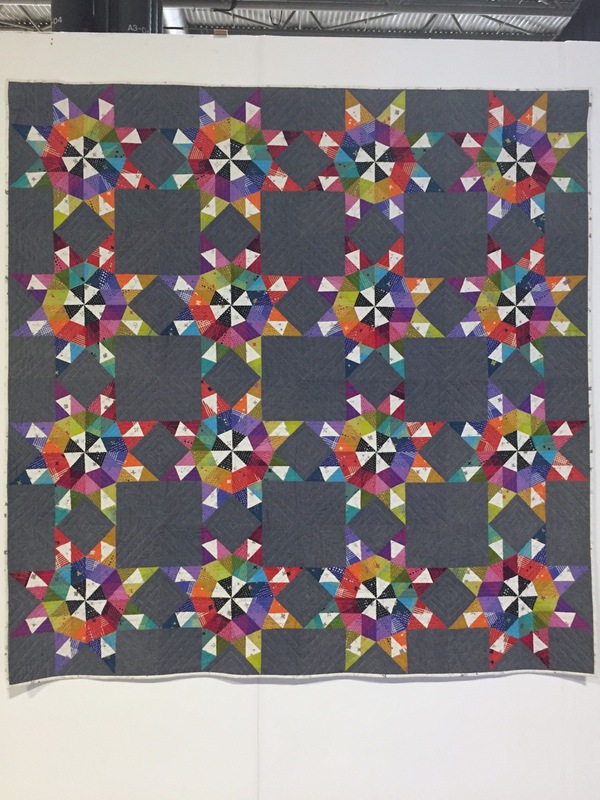 I'm not usually drawn to compled quilting but this really sang for me. I recognise this beauty from Instagram, ' Can You See Me Now' by Rebecca Bell, even better in person. 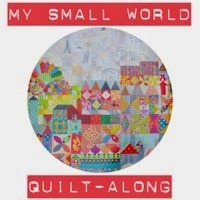 One of the joys of walking around was meeting fellow members of South West Modern Quilt Guild and seeing their quilts. I've seen both of these at various points of their making journey and it was amazing to see them complete, and on holding their own on display... they both feature ingenious use of bias binding. 'Curled', By Charlie Mankin. Inspired by Dissociazione dal Bordo, 1969 by Franco Grignan. 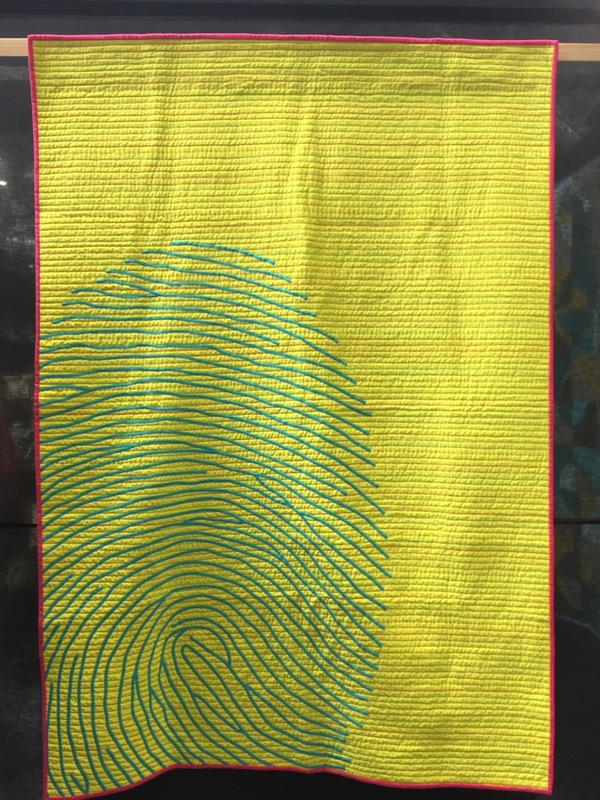 'Under The Thumb', by Melanie Turbitt, based on her husband's thumbprint. This is Jo Avery's Month In The Country Sampler from the BOM she designed for Today's Quilter last year. 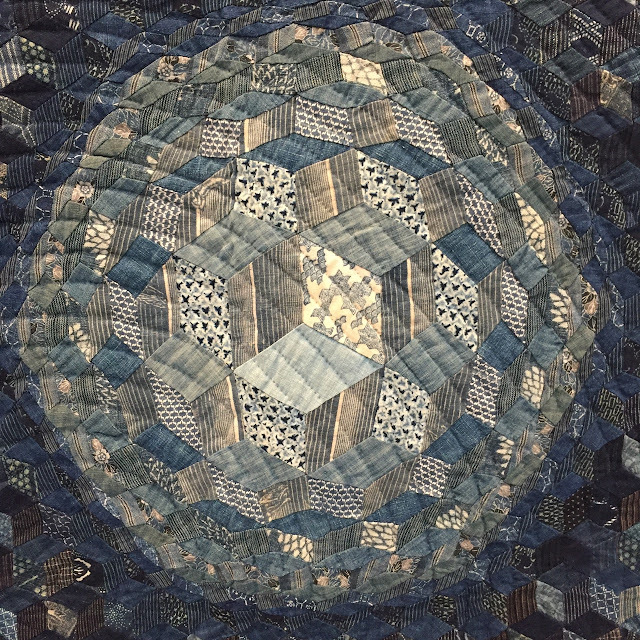 Jo had multiple quilts in the show and even managed to include my blocks in The Threahdouse Medallion quilt- mine are the cornerstones and the whole quilt was made with blocks that represented the classes Jo, Karen Lewis and I taught- the retreat attendees each received a free pattern! Happenstance', by Sarah Hibbert. Inspired by taking Jen Carlton-Bailey's drunkards path class at Quilt Con. 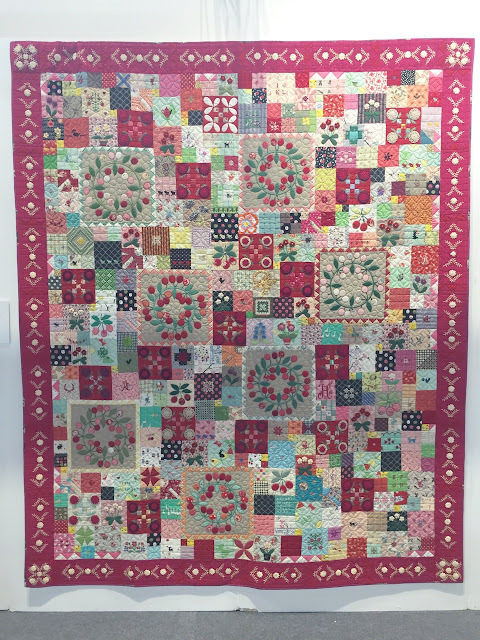 This beauty is 'Hoopla', pieced by Nicky Eglinton and quilted by Trudi Wood. 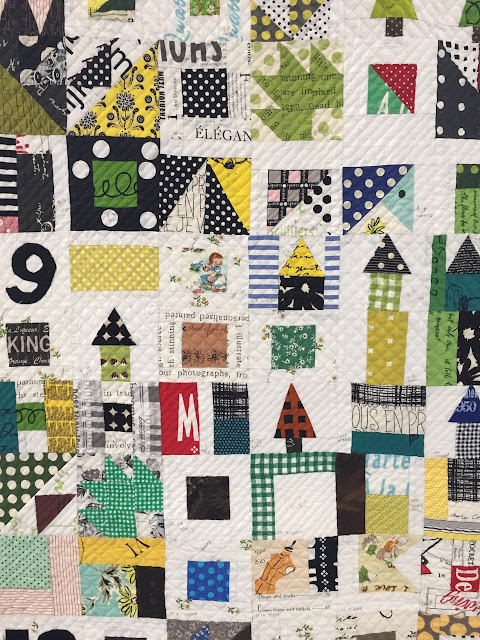 A mammoth size and playful take on the a Double Wedding Ring Quilt. I loved the simplicity of this next one, 'Retro' by Sophie Zaugg, the straight line quilting was beautifully executed and I love the colour combination. Note the two colours of thread, nice touch! I've had a few gentle weeks of recovery after a small operation. 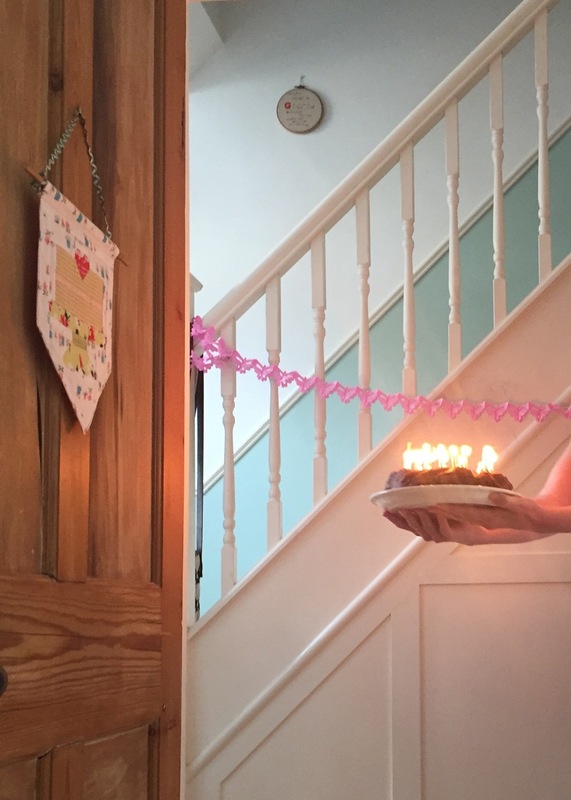 There have been two family birthdays so ample supplies of cake and time together. I was lucky enough to be a part of Sarah Ashford and Charlie Mankin's Great British Quilter collaboration with Aurifil which was launched last week. 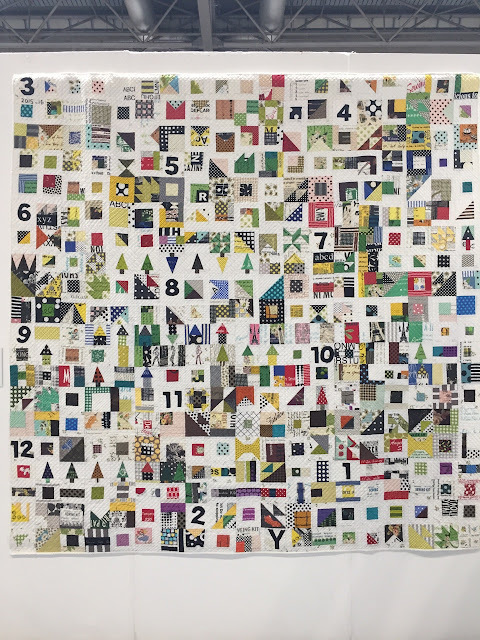 Each thread represents a British quilter, I'm Spring Green 1231, read more about it here. I feel immensely proud to be included and in the company of eleven talented, creative women. 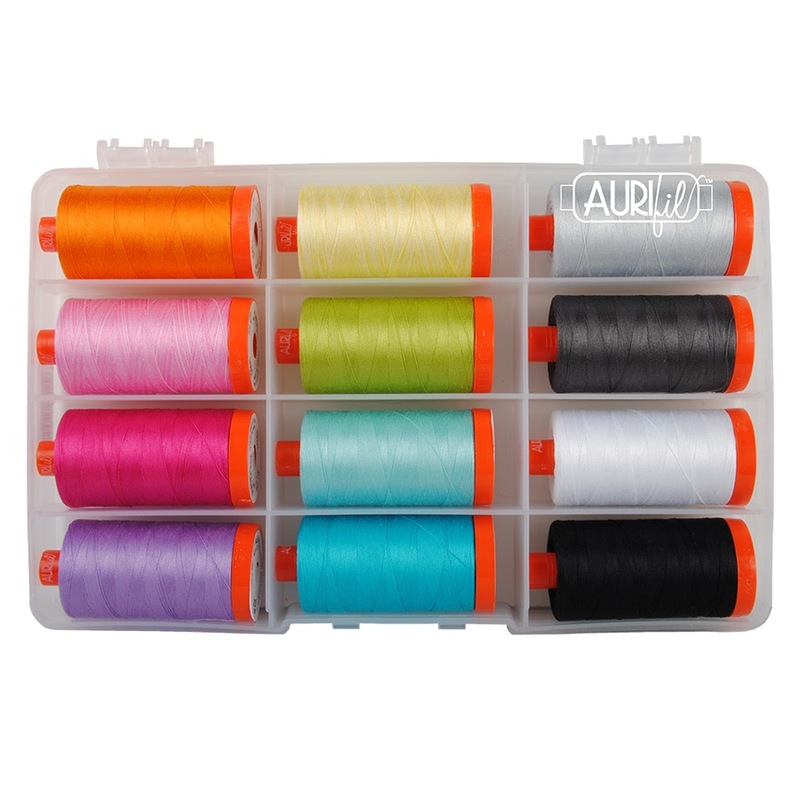 These beautiful boxes of 10 x 50wt spools go on sale at The Festival of Quilts starting Thursday 9th August. It's my first visit to FoQ and I'll be there on Thursday, including being part of a special live event at the Aurifil stand C1 at 4pm. 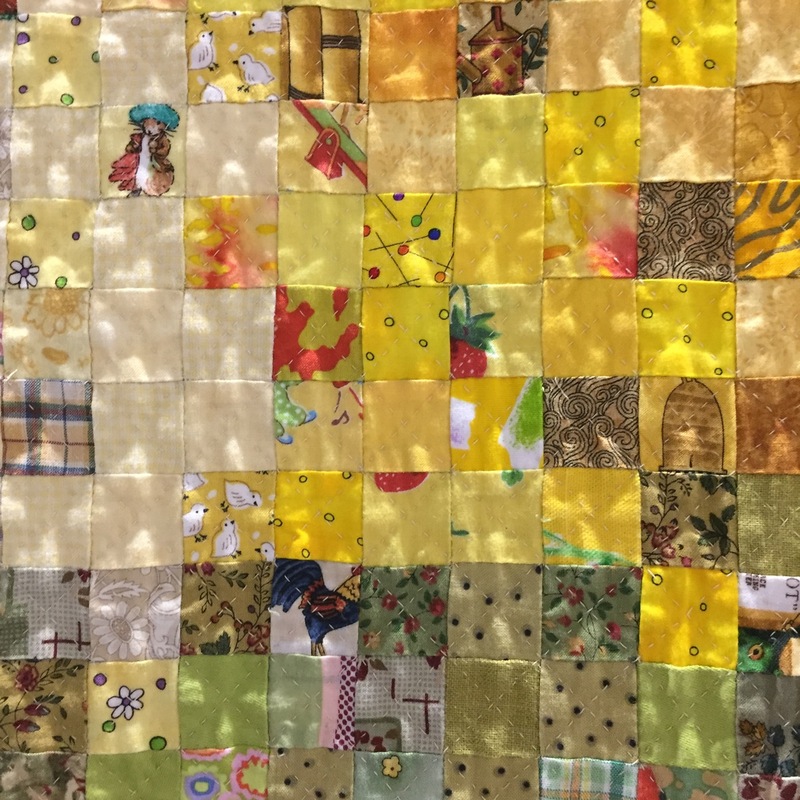 Karen Lewis will also be on the Aurifil booth signing her new Wabi-Sabi sewing projects book Otherwise, I'm aiming to get around as many exhibits as I can and save a little time for visiting the vendor stands. If you see me, come and say hello!